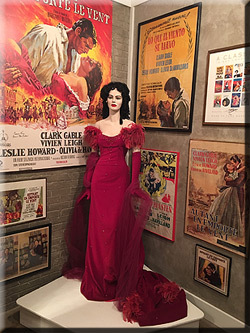 Gone With the Wind Museum, the pride of Bobbie Hardy whose late husband, Randy Hardy, was most supportive of her love for the epic and, together, they amassed an impressive GWTW collection. 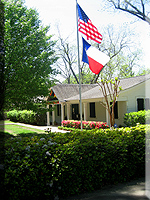 After living in Houston for more than 30 years, the Hardys moved to the historic riverport town of Jefferson. They were inspired by the spirit of the citizens of Jefferson, their love of history and their determination to preserve the past. 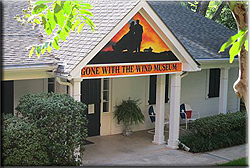 A Gone With the Wind collection seemed to fit perfectly in this locale, some 30 miles south of Randy's hometown, "the other Atlanta". The museum, which opened on November 27, 1998, has welcomed thousands of fans from all 50 states , the Virgin Islands, and Argentina, Australia, Austria, Barbados, Belgium, Brazil, Bulgaria, Canada, Chile, China, Colombia, Denmark, El Salvador, England, Finland, France, Germany, Greece, Hungary, Iran, Israel, Italy, Japan, the Marshall Islands, Mexico, The Netherlands, New Zealand, Norway, Panama, Peru, Poland, Romania, Russia, Scotland, Slovakia, South Africa, South Korea, Spain, Sweden, Switzerland, Taiwan, Thailand, and Ukraine. 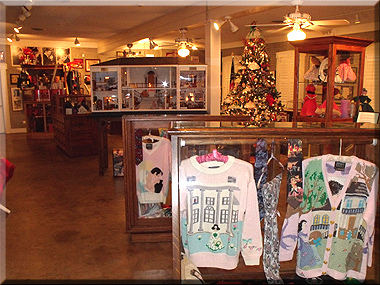 Visitors enjoy a self-guided tour of the museum filled with more than a dozen antique cabinets displaying memorabilia. 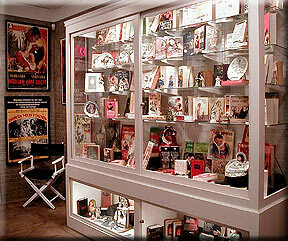 On the walls hang numerous domestic and foreign movie posters, as well as other memorabilia relating to the novel and motion picture. 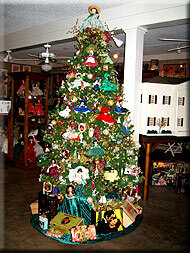 A one-of-a-kind Gone With the Wind-themed Christmas tree is decorated with dozens of GWTW ornaments and more than 40 8-inch Madame Alexander dolls. In memory of Bobbie's friend, JoAnn Elliott Bond, the tree's creator, the museum celebrates Christmas every day of the year. 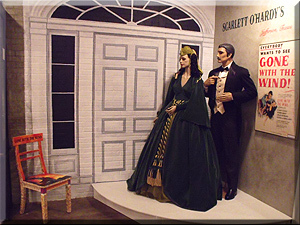 One of the museum's most popular attractions is a reproduction of Scarlett's green drapery dress, designed by Walter Plunkett and proclaimed by many to be the most famous costume in movie history. Your perfect Jefferson photo-op is standing with Scarlett and Rhett in front of the doorway of Tara. The mural was hand-painted by Jefferson artist Mickie Moore. Created especially for Tara in Texas II and the event's grand finale, The Dixie Belle Showboat Returns to Jefferson, you will find a masterpiece by TJ's Custom Kakes of Avinger, Texas. 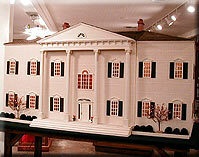 Covered in fondant icing, the one-of-a-kind "cake" is a re-creation of Tara and its surrounding buildings and gardens. A pair of original seats from Loew's Grand Theatre in Atlanta, site of Gone With the Wind's 1939 world premiere, invites visitors to rest a moment beneath a large medallion poster featuring Clark Gable and Vivien Leigh as Rhett and Scarlett in their famous "flaming embrace." 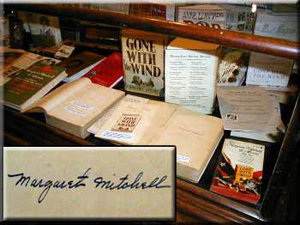 Two cases display more than 100 editions of Mitchell's novel, both from the United States and abroad. 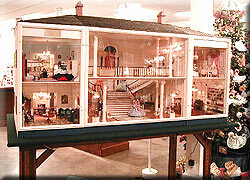 A wide variety of GWTW character dolls produced by Madame Alexander and The Franklin Mint delight both young and old. The Madame Alexander collection includes donations from Jane Eastland, Stacey Newell Davis, and Carolyn Craig Nelson. Three large cases are devoted to author Margaret Mitchell and her 1936 Pulitzer Prize-winning bestseller. 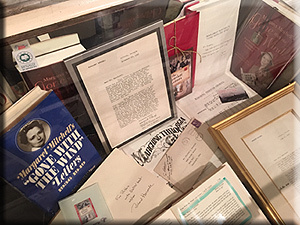 Among the items on display are a signed first edition of Gone With the Wind; a letter from Mitchell on her personal stationery; a Christmas card, with its original envelope, signed "Love, Margaret and John [Marsh]," and numerous photographs and biographies of the creator of Rhett and Scarlett. 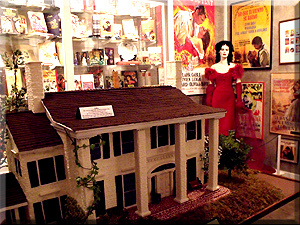 The museum is home to dozens of items from the motion picture's original release, including magazines with GWTW covers, such as Time, Look and Progressive Farmer ; a Nunnally's "Scarlett Chocolates" candy box; original Atlanta newspapers featuring coverage of the premiere; a program from the Atlanta Junior League's Gone With the Wind Ball; wooden nickels, a matchbook, paint book; a rare movie program featuring Hattie McDaniel as Mammy on the back cover; an original Hattie McDaniel letter dated January 9, 1940; original handkerchiefs, scarves, jewelry, perfume bottles and "Scarlett O'Hara" games. Six cases devoted to the continuing phenomenon of the book and film demonstrate just how much a part of American popular culture the beloved story and its characters have become. A large glass-front bookcase displays books about the novel, the film and its creators and stars. 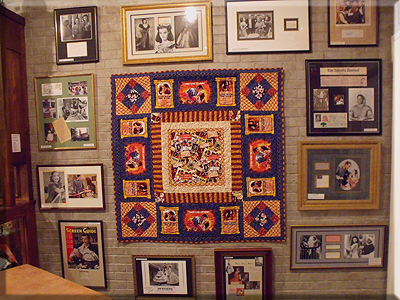 The museum is honored to display a quilt pieced by Bobbie's lifelong friend, Ann Barnes, and quilted by Denise Givney. 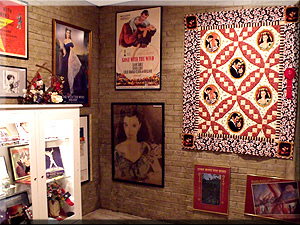 This GWTW quilt won 2nd place in the 2011 Jefferson Quilt Show. 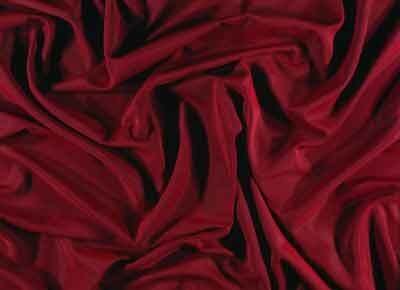 Quilting Treasures produced the 100% cotton fabric used in the masterpiece. representing Cammie King as Bonnie Blue Butler. 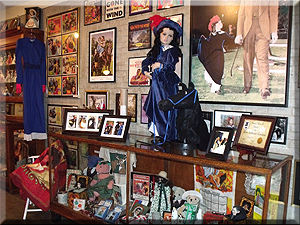 dolls, figurines, and a vast collection of autographed stills. The museum is home to more than 100 foreign editions of the novel including copies from Bulgaria, Chile, Czechoslovakia, Finland, France, Germany, Great Britain, Italy, Japan, Latvia, Lebanon, Poland, Romania, Russia, Spain, Turkey, Vietnam, and Yugoslavia. by J. M. Arnau, Barcelona, Spain. Linda and Danny Hass, owners of Country Arts Gallery, LaGrange, Texas. 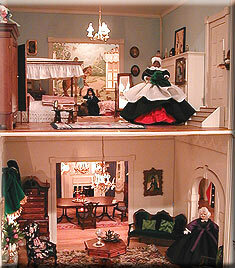 The eight rooms represent three GWTW houses: the big hall, dining room and library at Twelve Oaks; the parlor and young Scarlett's bedroom at Tara; and Rhett's, Scarlett's and Bonnie Blue's bedrooms in the Atlanta mansion. Aunt Pittypat visits in Tara's parlor, and the beautifully appointed dining room at Twelve Oaks awaits the "war talk" scene during the barbecue.